The negotiations with North Korea may be stalled, but President Trump’s effort to win a Nobel Peace Prize for holding peace summits and building a beautiful friendship with Kim Jong-un definitely isn’t. 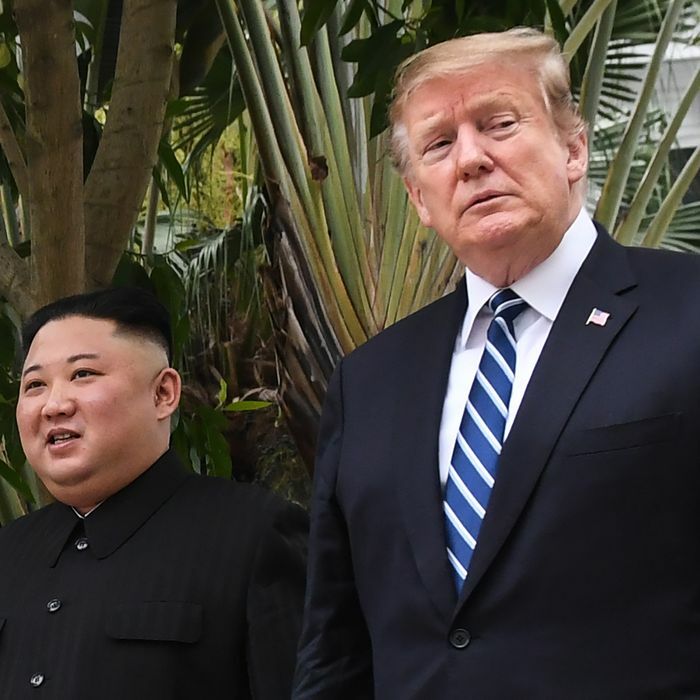 On Saturday morning, the president responded approvingly to news that Kim would be open to a third meetup between the two leaders — under certain potentially unmeetable conditions. Per Korean state media, Kim gave a speech on Friday in which he sharply criticized the U.S. for failing to offer peace on at-all-agreeable terms, but added that he felt he had a good relationship with Trump and was willing to try another summit provided that the U.S. “quit its current method of calculation and approach us with a new one” before the year’s end. Also on Friday, Kim reshuffled North Korea’s leadership, further consolidating his power over the country as its economy reels, in part, because of sanctions. But unfortunately for Trump — and peace — the U.S. and North Korea remain very far apart when it comes to any possible deal. It’s the same place they were standing at the end of the failed talks two months ago in Hanoi, where the goal was to come up with a substantive agreement after failing to do that at the first summit in Singapore last June. The two sides still can’t agree on a definition of “denuclearization,” let alone how it would take place. Trump continues to tell Kim that North Korea will become a big, bright star in the world once it gives up all its nuclear weapons, which remains the Trump administration’s precondition for removing sanctions. (The U.S. also wants North Korea to give up its chemical and biological weapons.) And while Kim has repeatedly said he is willing to give up his nukes, he also wants that process to be incremental, i.e., much easier to get around. North Korea has a well-earned reputation for deception when it comes to dealing with other countries, and it has refused to even entertain the idea of outside inspections of its arsenal, meaning it would not be possible to determine what it had and had not given up. Photo ops and empty enthusiasm aside, the U.S. has gotten no meaningful concessions from North Korea as a result of the two Trump-Kim meetings over the last year, and there’s little reason to presume a third will make any difference. North Korea may have temporarily stopped testing its ballistic missiles, but it has kept building its nuclear arsenal. Kim has also vowed that he will not cave under U.S. sanctions, the regime has threatened to restart its missile and nuclear-weapon testing if the U.S. doesn’t end them, and there has been plenty of evidence that it has been actively flaunting the sanctions as much as possible. Since this nonsensical peacemaking process began, Kim has gotten long-sought handshakes and peacemaking publicity from his meetings with Trump and Moon. He’s also gotten Trump to call off joint military exercises with South Korea, go against his own administration to block a new round of harsher sanctions, and tease the idea of making countries like South Korea pay for the privilege of having an in-country U.S. military presence. As a bonus for Kim, the world leader who once bragged about how much bigger his nuclear button was has continued to publicly profess, ad nauseam, how much he thinks of Kim, how great their relationship is, and how well-off North Korea’s future will be under Kim’s leadership. Aside from the fact that the Hanoi talks should have never happened, since there was arguably no chance they would amount to anything, Trump reportedly held his ground as he should have. Kim scoffed and the summit and negotiations were over. Now, less than two months later, after making additional concessions without reciprocation, Trump is indicating that he loves summits almost as much as he loves talking about his personal relationship with Kim Jong-un. There probably won’t be a peace deal if a third summit happens, but there will definitely be a spectacle.